Dubai, UAE, April 10, 2019: Now that spring is quickly approaching, it's time to add those bright and bold colors to our make-up armory. 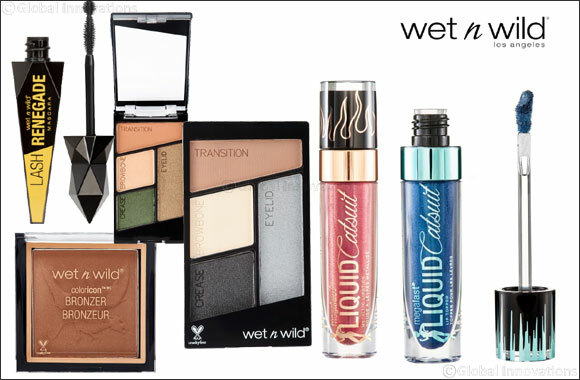 Wet n Wild has launched two new limited-edition collections for you to love. The first is the Fire Dragon vs. Ice Dragon Collection, which embodies the fantasy world where cool tones contrast the warm tones, blending seamlessly to create gorgeous spring looks. The second is the Fantasy Makers Collection, with the brightest of colors, both matte and glittery, to create a statement look this season. Wet N Wild is one of the most well-known cruelty-free make-up brands with a wide selection of products for every skin and face type. Wet n Wild products are so affordable, making it possible for everyone to use their wonderfully pigmented and safe products to achieve a desired look. In this striking collection, you'll find the super pigmented and buttery formulated bronzer in “You're Dragon Me Down”. Don't be fooled, though – this product will do nothing but elevate and chisel your face, bringing out your inner dragon queen: powerful and unstoppable. Use the Pro Contour Brush from the collection to achieve your best contour yet. This highlighter puts the “ice” in Ice Dragon. The cool-toned pearl pigments have an incredible pay-off, and illuminate the face to give you an angelic look. Use this on the high points of your face to for instant radiance. Shine on! Worlds collide with these two eyeshadow quads, as warm tones meet cool tones, and neutral meets bold. The highly pigmented powders and the soft touch formula are not the best part of these dynamic products – they are both under AED 30! Mix, match, and blend to create an artistic look this spring. Come again? A rainbow highlighter? This unique and distinctive piece has multicolored, micro-fine pearl pigments to produce a literal rainbow. Add a pop of color to your makeup and create a seemingly different look with each use! You can use each individual shade by itself, or blend them for a glowing dash of color to your cheekbones. This glitter eyeshadow palette unites neutral and bold shimmery pigments, so that you have a varied selection to choose from when creating your bold spring look. Pair it with matte eyeshadows, a perfect stroke of eyeliner, and a great mascara, and voila! Your look is complete. Out with the old, in with the new. You need this mascara in your make-up collection – the distinctive brush volumizes, defines, lengthens, and curls your lashes all at once. With this, you can ditch your generic mascaras, and (dare we say) your strip lashes, too! The perfect all-in-one product to top off your bold eye look, it's an essential purchase this spring.